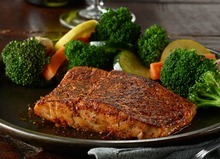 Grilled North Atlantic fresh salmon seasoned in Cajun spices on a bed of power grain rice blend. Served with your choice of house salad and one side item. Grilled Crimson Snapper seasoned in Cajun spices on a bed of power grain rice blend. Served with your choice of house salad and one side item. Premium Crimson Snapper and hand-breaded shrimp. Your choice of two side items, tartar sauce and cocktail sauce. 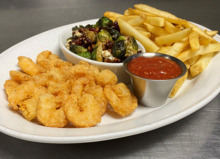 A generous portion of shrimp hand-breaded and seasoned in our kitchen, then fried. Served with your choice of two sides and cocktail sauce.